I have a confession to make. I never know where my “muse” will take me next. It has been an exciting literary journey–my writing has evolved in many unexpected way, including recently into the realm of powerful and suspenseful contemporary women’s fiction, which I shall continue to write under my own name, Brenda Joyce. I have never lost sight, however, of my audience–my historical romance readers, and especially fans of my books featuring the Bragg family. To this day, many of you still clamor for more Bragg books. Well, imagine my surprise when my “muse” prompted me to begin a new historical romance suspense series–and then I realized a Bragg had to be the hero! And so the nom de plume B.D. 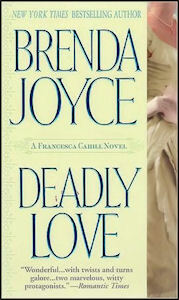 Joyce was born, and with it, the first book in an ongoing series, Deadly Love. Welcome to the world of Francesca Cahill, crime-solver extraordinaire. Francesca is no ordinary heroine. She refuses to bow to convention, wears her heart on her sleeve, and is determined to right the ills and injustices of society/ Deadly love begins Francesca’s mad escapades when the neighbors’ little boy is kidnapped right out of his bed during a society ball. It is January 18, 1902. Francesca stumbles across the ransom note just as she meets New York City’s newly appointed police commissioner, Rick Bragg. And Fracesca can no more stay out of this investigation than she can stop herself from falling love with the city’s determined and powerful police commissioner. But little does she know that on this singular night, he life will change forever. Let me take you back in time to the lost, magical world of turn-of-the-century New York City–where the glittering mansions of society’s elite are only footsteps away from the impoverished back alleys of the city’sunderbelly–and into the heart of true danger and even truer passion. Listen to a audio clip from Deadly Love, now available on Audible, an Amazon company. Saturday, January 18, 1902 – 8 P.M. There was a soft rapping upon her door. Francesca Cahill recognized the knock and she froze, hunched over her desk, a Waterman fountain pen in hand. Electric lighting, installed when the house was first built eight years earlier, spilled over the vellum she was writing upon. She felt like a crook caught with his hand in the bank safe. Her sister did not wait for her to answer, and she entered Francesca’s large, beautifully appointed bedroom. Outside, it was snowing heavily; inside, a fire roared in the dark green marble hearth. “You’re not even dressed!” Connie cried, eyes widening so vastly that the effect was almost comical. Francesca forced herself to smile as she jumped to her feet, effectively blocking Connie’s view of the desk. She stole a guilty glance at the grandfather clock standing in the corner of her room. Eight o’clock already? Guests would be arriving at any moment, if they hadn’t begun to arrive already. “I’m sorry,” Francesca said, unable to breathe properly. Darnation! She had an examination in biology on Monday morning, and she had yet to even begin studying for it. She had been too busy organizing this latest endeavor of hers, and now time had run out. But then, there was never enough time in the day for her to do all that she had to do. It was so frustrating. Her sister faced her with exasperation, clad in a pale pink evening gown, her throat encircled with diamonds, her pale blond hair pulled loosely back and piled on top of her head. Diamonds fell from her ears and a diamond and ruby necklace decorated the expanse of bare skin between her shoulders and her bosom. She was a very beautiful woman. “Fran, how could you do this?” Connie implored. “You know what Mama has in mind for you tonight. She begged you not to be late and you promised. I know. I was there.” Connie shook her head. Francesca did feel a bit guilty, because she most certainly had promised their mother, Julia, that she would not be late, that she would be well dressed and on her best behavior. Francesca remained standing in front of her desk. On occasion, Connie was the biggest snoop. Francesca did not want to get into an argument now, even if her older sister did mean well. She smiled, far too brightly. “I was writing letters, the time escaped me,” she said, crossing the fingers of her right hand behind her back and silently apologizing for the very small white lie. “I don’t believe you,” Connie said, and she marched right past Francesca and lifted the sheet of parchment that Francesca had been working on, ignoring Francesca’s exclamation of protest. “What is this?” she cried. And while she read, Francesca silently recited the words she had written, over a hundred painstaking times. Time: Saturday, January 25 at 3 o’clock P.M.
Francesca folded her arms. “Connie, you know as well as I that the tenements are a disgrace to this city – a disgrace to you and me,” Francesca said fervently. Connie’s brows arched impossibly – and it did not detract from her stunning beauty. “What I know is that you are an eccentric, Francesca Cahill. And what I also know is that you are late and that no matter how you think to try, eventually, Mama will have her way.” She gripped Francesca by the arm and dragged her to the window. “Look!” she cried. Through the velvet draperies, which were open, snow could be seen dancing through the night in tiny swirling points of brilliant white light. Francesca’s bedroom was on the second story of the family’s five-floor, Fifth Avenue mansion. The snow had already blanketed the front lawns and the poplar trees, as well as what could be seen of the sidewalk and street, which lay just beyond the wrought-iron front gates. Francesca looked down on the circular front driveway, the lawns, and Fifth Avenue. Had the evening been clear, she would have been able to make out the tall iron street lamps with their double-headed white bulbs and the even taller trees of Central Park. Already two four-in-hands, a hansom, and a very dashing motorcar were coming up the driveway, the effect almost magical, the vehicles spookily emerging from the mist like clouds of snow and electric lights. Beyond the drive, the lamp lit street was eerily deserted. Because the Metropolitan Club was two blocks down, there was usually a high degree of traffic on the avenue. Tonight the weather was causing most of the city to stay home. “Francesca, don’t you belong to enough societies?” Connie’s hands found her slim hips. Lord Neil Montrose was Connie’s husband; they had married four years ago. Although he had a home in Devon, they spent most of the year in the States, preferring to summer in Great Britain. Francesca knew she would have to press her sister to join her next Saturday even if she was free. Not that Connie was opposed to charity and good works; like their mother, she was quite active in such affairs. But her idea of active and Francesca’s varied dramatically. Connie preferred lavish balls, the tickets to which cost hundreds of dollars. “Please try to come. If I give you a dozen flyers, could you hand them out this week at Montrose’s dinner party for Livingston?” She was prepared to beg if need be. “Please? I am desperate for attendees.” She smiled hopefully at her sister. Francesca glanced at the big four-poster bed in the middle of her room. Half a dozen evening gowns were strewn there amongst all the green, blue, and gold pillows and shams, along with the appropriate undergarments and accessories. “How about the black?” she suggested dryly. Francesca shrugged. “Why does she insist on tormenting me so?” she asked as she stepped out of her white shirtwaist and fitted dove-gray skirt. “I said ‘welfare,’ not ‘happiness.’ ” Connie began pulling on the ties. “And I do believe Mama has given up on the idea of a suitor. You are twenty years old, my dear. She is going directly for the husband.” Connie’s smile was serene. Connie had to smile again. “You are so funny, Fran. Look at the bright side. Maybe your future husband will be a radical reformer with a capital R, like you yourself!” Connie started to giggle. “I am thrilled to be such a source of entertainment,” Francesca grumbled. “You do know that Mama suspects something?” Connie dropped the pink gown over Francesca’s head. “Ho, ho, ho,” Fran said sarcastically. But Connie was making a valid point. Julia Van Wyck Cahill was as determined as Francesca was – if not more so. It was a rare day indeed that Julia did not get her way. “This color suits you, Fran, you will be ravishing tonight,” Connie said with admiration in her blue eyes. “Mr. Wiley will be smitten,” she added slyly. “Good! For then he will deem me madder than a hare.” Francesca grinned. “No such luck,” Connie said cheerfully, producing a pair of beaded silver slippers. “I have so much to do, and instead of being occupied in a useful endeavor, instead of being intelligent and using that intelligence, I must spend the evening being paraded in front of society’s most eligible and dull bachelors,” Francesca complained, meaning her every word. “I just do not understand you,” Connie said flatly, moving into the bathroom. Reluctantly, Francesca followed. “I mean, there are no female journalists. Which you well know. Ah. Rouge. So you do have a vain streak,” Connie said triumphantly. Connie gave her a look. It was somewhat patronizing. But then, her entire family refused to believe that she truly meant what she said and what she intended. Francesca loved to write. But it was more than that. For she was a passionate reformer, just as her father was; she had joined the ladies’ auxiliary of the Citizen’s Union Party when she was seventeen. What better way to bring about reform than to write scathing articles about poverty and corruption? The reporter Jacob Riis was her idol. She had read his book, How the Other Half Lives, years ago, twice. Like most of those who had read that shocking account of life in the slums of New York City, Francesca had been appalled and shaken. That book had changed her life. For she herself had so much. It was almost shameful. She had to do something to help those less fortunate than herself. Connie retrieved the pot of rouge, placing it safely on the sink. After Connie had helped her put up her hair and don a small pearl cameo and matching ear bobs, Francesca allowed her sister to pose her before the mirror. Their eyes, both the exact same shade of blue, met in the looking glass. Francesca had to admit that the gown with its fitted waist and flowing skirt was beautiful. The sleeves were two small caps just covering the points of her shoulders. “Have I ever worn this before?” she asked, puzzled. The gown seemed vaguely familiar. Francesca made a face at the mirror. “My memory is returning.” She made another face, a pouty scowl. That might put off Mr. Wiley, she thought. The two sisters strongly resembled one another. Connie was fairer; Francesca’s skin and hair were tinged with rich hues of peach and gold. “Beauty fades. Character lasts forever.” Francesca was firm. Connie rolled her eyes heavenward and she guided Francesca out of the bathroom, through the bedroom, and out of the door, keeping a grip on her all the while. The ballroom was on the mansion’s third floor. But guests would be arriving in the hall on the ground floor first. The sisters descended the wide white alabaster staircase, which led to a huge marble-floored hall with Corinthian pillars set at intervals, marble panels on the wall, and a high ceiling sporting a magnificent mural depicting a pastoral scene. The Cahill home had been dubbed “the Marble Palace” from the moment its construction had been completed. At least two dozen guests had already arrived, with several groups arriving through the front door, handing their cloaks, hats, and umbrellas to the doormen. The sisters paused on the last landing. Julia stood poised between the hall and the reception room, greeting guests as they entered. She was resplendent in dark red silk and black lace and more diamonds than anyone had the right to wear. Francesca suddenly shivered. Whom was she fooling? She was no match for her mother. Her heart seemed to sink like a rock at the very thought. “Thanks for the help, Connie,” she finally said. Connie squeezed her hand reassuringly. “Chin up. There are some dashing rogues present. If Wiley’s not the one, tonight might very well be your lucky night anyway.” She smiled and sailed off. Francesca glimpsed Montrose across the hall, chatting with a group of men. Her heart seemed to stammer to a halt briefly, before resuming its beat. He was tall, dark, and dangerously handsome, especially in his evening clothes, and he did not glance her way, not even once. For one moment she watched him as Connie joined him, slipping her arm around his waist. Montrose smiled fondly down at his wife, briefly pulling her even closer. Resolutely, Francesca turned away.